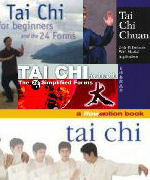 There must be hundreds of books about the tai chi 24 form and we can't read them all, much as we would like to. What we have done is provided a list of the books most recommended by friends, teachers and readers at the various on-line book stores. Improve with just 15 minutes a day. Build experience week by week . We have also tried to include a mix of modern books written in the last few years, which tend to concentrate on the mechanics of tai chi postures, and older books. Older books tend to focus a lot more on the philosophy behind tai chi and the principles. The first tai chi book we ever bought. We learned the simplified Beijing 24 form from this (as well as going to classes). And let me tell you it is not easy holding the book at arms length while trying to do snake creeps down. We liked it . You should be able to order this from most good book shops or Amazon. And, we should mention that there are at least 3 different versions of the cover - Rosie nearly bought it twice! This book contains step-by-step instructions and photos of the Six Easy Steps for the Beginners and 24 Forms. 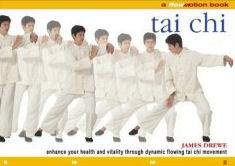 It also shows you how to progress to higher levels of tai chi. Not seen this one but Rosie trained with Paul Lam and has his other stuff - she would try unseen. One of China's top-ranked coaches to Tai Chi provides an illustrated guide to the 24 and 48 postures, including tips on breathing, aligning the body, and developing Chi. Martial applications are also surveyed in a presentation notable for its many step-by-step black and white photos which excel in illustrating positions and movements. Teaches how to perform the 24 forms in a manner that is accurate while being easy and fun to learn. Also serve as a reference for the experienced Tai Chi Chuan enthusiast.